Prior to the 2017 season, a runner’s baseline (excluding a rundown) was restricted by the fielder’s tag attempt with ball in glove or hand and extended toward the runner. This season, however, there is a rule change. A fielder no longer has to have ball in glove or hand extended toward the runner to restrict his baseline. A fielder’s movement toward the runner is sufficient. The rundown rule has not changed. During a rundown, the runner’s restricted 3-foot baseline starts the moment the rundown begins. It is a line to the base he is going to and a line to the base he came from-and he has 3-feet in either direction of those lines. The baseline changes with every throw. A tag attempt is not necessary. Two running out of the baseline plays that relate to the updated tag attempt/baseline rule occurred on Tuesday night. The first one took place in the Pirates-Braves game in Atlanta. In the top of the first inning the Bucs had Josh Bell on third and Francisco Cervelli on first when John Jaso tapped a roller to the left side of home plate. 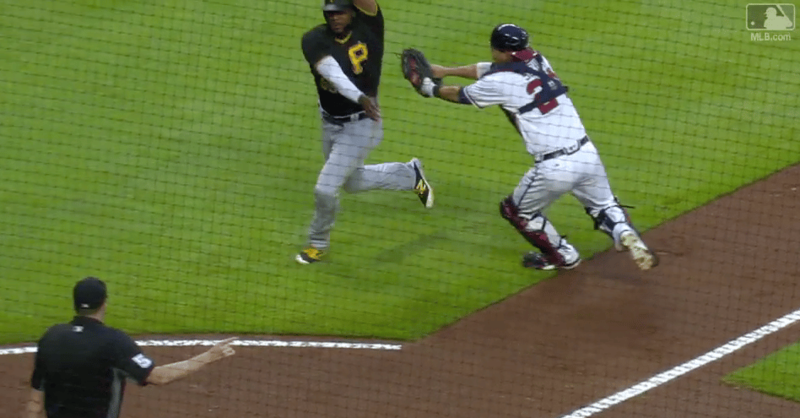 Braves’ catcher Kurt Suzuki fielded the ball and attempted to tag Bell who was coming down the line from third. Plate umpire Nic Lentz called Bell out for running out of the baseline per rule 5.09 (b) (1) that reads, When determining whether a base runner should be called out under Rule 5.09(b)(1), so long as the umpire determines that a play is being made on the runner and an attempt to tag is occurring, i.e. the fielder is moving to tag the runner, no physical tag attempt is required to call a runner out for leaving the base path. When you look at the play, it’s a good idea to freeze frame this from the time Suzuki (with ball) moves toward Bell. The moment Suzuki took a step toward Bell, his baseline was restricted to 3-feet in either direction of the line to the base he is going to (home plate) and the line to the base he came from (third base). One of the announcers on the game reportedly said that when Suzuki extended his glove, that is when the baseline was restricted. This is no longer true per rule 5.09 (b) (1) which is a departure from the old rule.